Patients who undergo surgery for brain cancer may need to be patient during recovery. Heather Wright will never forget the moment she learned that her headaches and occasional bouts of left leg weakness were caused by a brain tumor. “My doctor said, ‘There’s something there. You have a 5-centimeter tumor in your cerebellum,’” she recalls. The news was more than she could process. In her doctor’s office a few days later, she felt “like I was about 2 inches tall in the gigantic Pacific ocean,” Wright says. She thinks her doctor talked about possible side effects of a surgery on a delicate and essential part of her brain, she says, but she couldn’t comprehend the information. Wright had surgery just over a week after her tumor was discovered. And though she was up and walking soon after the procedure, her recovery is a continual process. It’s difficult to generalize about recovery from surgery for brain tumors, because there are over 100 different types of malignancies and the human brain contains hundreds of complex structures and billions of connections. “The problems you’re going to have before and after surgery are dependent on where in the brain the tumor is and what kind of tumor it is,” says Michael O’Dell, chief of clinical services in the Department of Rehabilitation Medicine and medical director of the Inpatient Rehabilitation Medicine Center at New York-Presbyterian Hospital/Weill Cornell Medical Center in New York. Yet, nearly all people who undergo surgery for a brain tumor will face challenges in the months after the procedure. “During the first couple of weeks after surgery, patients and families are barely starting to process what just happened,” O’Dell says. “It’s when (they’re) out of the hospital, beyond the scary surgical time and back in their home environment, that folks really begin to understand what their deficits are. That’s when it dawns on you how much your ability to care for yourself may be affected or how your ability to think, remember things and interact cognitively has been affected.” Proactively recognizing the challenges of brain cancer surgery can help facilitate recovery. Because the brain is such a sensitive and important organ, medical teams carefully map the location of any brain tumors, using different imaging scans, prior to surgery. They then develop a surgical plan and discuss the potential effects of brain surgery with patients and families. The goal is to remove as much of the tumor as possible without unnecessarily interfering with essential brain functions. Physicians try to help patients and families understand the risks and possible side effects of surgery, but “We just never know to what extent or degree patients are going to have deficits,” says Nancy Staton, a neurosurgery nurse coordinator at the University of Virginia Cancer Center in Charlottesville, Va. Certain factors, such as the size and location of the tumor, as well as the patient’s overall health and the surgeon’s skill and experience, all contribute to the outcome of the surgery. Most patients ultimately emerge from brain surgery much as they were. “The whole goal of the surgery is to keep people whole, to keep them intact,” says Steven Brem, a neurosurgeon and co-director of the Brain Tumor Center at the Hospital of the University of Pennsylvania in Philadelphia. “If they had a sense of humor before, they will still have a sense of humor. If they could play the piano, they probably will. If they couldn’t play the piano, they probably won’t be able to,” although it’s entirely possible that they could learn to play after recovery. After surgery, patients are moved to an intensive care unit, where nurses and physicians carefully monitor their brain function and vital signs, and try to ascertain any deficits or complications, Brem says. Talking and walking soon after surgery are good signs, he says, but postoperative difficulty with speech, movement or memory does not necessarily mean that a patient will experience permanent disability. Transient deficits caused by swelling or bruising in the brain are common and generally improve over a period of weeks, he says. 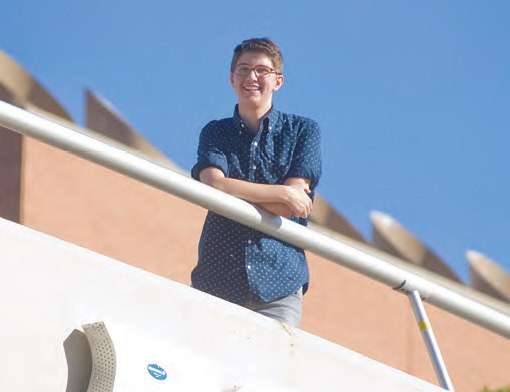 Despite some trouble remembering words after undergoing craniotomy for an astrocytoma, Charlie Blotner now attends the Honors College at Arizona State University. Photo by Michael Ging. If no complications develop, patients are moved to a regular hospital room after about 24 hours. Almost all patients undergo an assessment by a physical and/ or occupational therapist. (If the language centers of the brain are affected, a speech assessment will be performed, as well.) The information obtained during the assessment will help the medical team decide whether the patient will need additional therapy or assistance before or after discharge. While some patients might undergo therapy for serious deficits including severe muscle weakness and difficulty with speech, others may experience only minimal effects, such as slight muscle weakness or memory problems. Yet even minor problems can cause major frustration. Blotner says he was thrilled to be able to speak after her procedure. Because his tumor was near the language center of her brain, she says doctors warned her that she might develop slurred speech and lose vocabulary as a result of her surgery. Immediately after the procedure, he says he was able to communicate clearly. But when he returned to school two months later, he says she noticed that he had a hard time coming up with words. Such apparently minimal deficits can cause emotional upheaval as one struggles to reconcile gratitude for overall good health with frustration over everyday limitations. Complicating matters is the fact that brain surgery is a nearly invisible injury. Once the incision has healed and hair has grown back, there’s little physical evidence of the procedure, although physical and cognitive effects can linger. Wright and Blotner agree that having supportive friends and family is essential during recovery. Physical and occupational therapy can help patients and families adapt to physical limitations if they occur. Neuropsychologists, rehabilitation medicine physicians, and occupational therapists who specialize in neurological rehab can help patients develop strategies, such as relying on written notes, to deal with cognitive problems. With time, many patients recover. Two years after surgery, Blotner is a sophomore in college, although he says she is experiencing continuing cognitive challenges. His teachers are aware of her needs and provide her written copies of lecture notes, if necessary, she says. Wright says she experienced a few complications after her procedure, including a cerebrospinal fluid leak that required an additional surgery to repair. Three years later, she says her physical and psychological recovery continue. > Anticipating the inevitable challenges involved with healing from brain surgery can make the process easier. > Adjusting after leaving the hospital can be the most difficult part of the experience, but ultimately, most patients emerge from brain surgery largely unchanged.